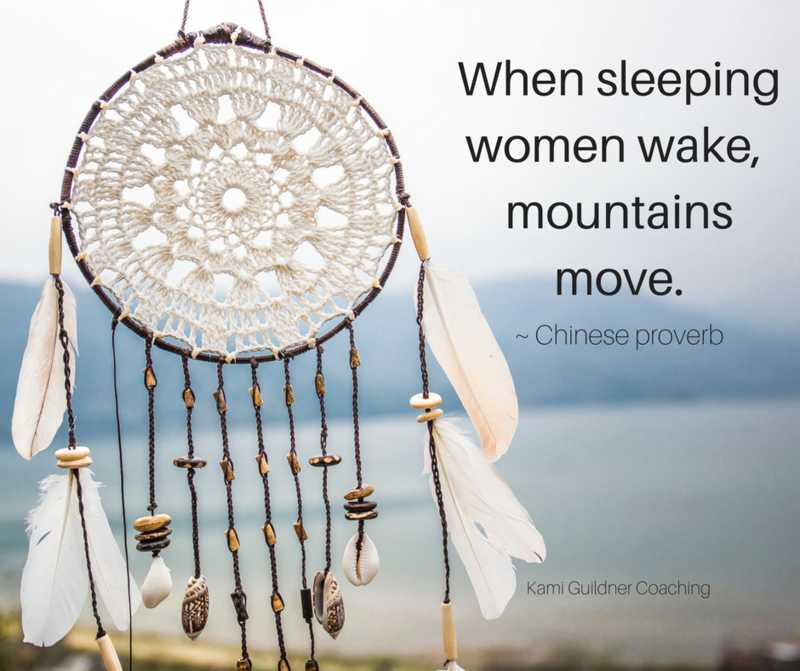 For the past few years, I’ve felt a rising energy of the feminine energy – YIN – among men and women. I’m talking about the compassionate side of human nature, moving from a flowing and receiving energy vs a driving, forceful energy. A paradigm that is grounded in desire, delight, passion. It’s a graceful, heart-based, wisdom infused and guided by seeing, feeling and connection. No doubt, the more masculine side of energy – YANG – is needed in our lives. We have to get things done. We have to be able to be strategic. But our society as a whole has lived so predominantly on this side for so long, I am feeling a HUGE shift in my circles of YIN RISING. The dance between YIN and YANG energy in our lives is powerful. We need to have space in our lives for both. We need to nurture both sides. And we need to balance it. Too much YIN and we don’t get things done. Too much YANG and we loose our connection to others and all around us that is so beautiful. So many of our women leaders have had to trailblaze with strong YANG energy, for so long. And in doing so, they’ve been bitchified, villianified, sexified for so long. Those trailblazers have battle scars… they’ve had to weather the storm. I’ve very aware of my own scars. Those raw pieces of me that get triggered in certain words, certain scenarios. I have them. Recently, I’ve been able to be in the presence of some of America’s most powerful women who have broken the very uppermost glass ceilings. At one point, I caught myself in judgement of the thin lips, the walled and contained energy, the carefully guarded telling of their stories. You see, I’ve spent a lot of time these past few years with women who have worked hard to bring these walls down. That’s my tribe. I’ve spent a lot of time bringing my own walls down, opening my heart, sharing my stories. Because of this, it was easy to see this dichotomy. But then I stopped to consider the trails these women have blazed. I considered how many times they were probably sexified, villianified, bitchified in their journey. I considered where they had probably spent their time this past year… past years… steeped in masculine-driven environments. No wonder their YANG approach has been so predominate. That is the only way they survived that journey. No wonder their energetic walls were up. My judgement washed away. I suddenly realized how much gratitude I should have for these women. As trailblazers, they have opened up the pathway. They have opened up the pathway for the essence of yin to rise in men and women around the world alike. And I see it everywhere I turn. Yin is rising. Women are speaking about feminine leadership. The popular thought leaders who are rising with messages of wisdom, heart, intuition, feminine presence, connection. And I feel it in my own calling to share in my own vulnerabilities, emotions, baring my soul. I feel it in how I want to share me with the world. We are able to bring these messages into the world BECAUSE of the trailblazing that came before us – their perseverance, their drive, their dedication. For that I am very grateful. And now is the time for YIN to rise. There’s HUGE power here… it’s shifting, evolving and growing in expansive waves. And I for one am honored to say I feel called. I am ready to own my part. Do you feel it? Are you in? Powerful title to your post – it drew me in right away! While my day-to-day world is fairly balanced in terms of yin/yang these days, during the early years of my sales career I often found myself the only women in the boy’s club. They pushed, expressed doubts and I’m sure a few were critical behind my back, but I survived it and to be honest, I wouldn’t have missed a day of it because there are few things that are more rewarding in life than accomplishing something others are convinced you can’t do. Thanks for the inspiration! In all of my learnings, I also know that the feminine energy is rising on the planet. I see how it is manifesting in many ways, including the conversations about women and equality that seem to permeated the public consciousness. It’s wonderful to see and acknowledge those who have come before us and to actually show them the respect that often the ‘history books’ fail to give them. There are many, many examples throughout history of women who have stood up and fought for women’s rights and I believe we are at a tipping point now in our humanity and getting closer to the big shift that in many ways is long overdue! Thanks for sharing your experiences and thoughts in this post, Kami! The more of us who talk about it, the closer it comes to happening.